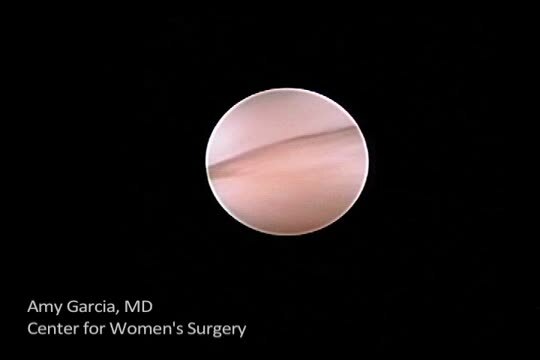 Dr. Garcia is Director, Center for Women’s Surgery and Garcia Institute for Hysteroscopic Training, Albuquerque, and Clinical Assistant Professor, Department of Obstetrics and Gynecology, University of New Mexico School of Medicine, Albuquerque. Dr. Garcia serves on the OBG Management Board of Editors. 1. Cicinelli E. Hysteroscopy without anesthesia: review of recent literature. J Minim Invasive Gynecol. 2010;17(6):703–708. 2. Munro MG, Brooks PG. Use of local anesthesia for office diagnostic and operative hysteroscopy. J Minim Invasive Gynecol. 2010;17(6):709–718. 3. Bettocchi S, Selvaggi L. A vaginoscopic approach to reduce the pain of office hysteroscopy. J Am Assoc Gynecol Laparosc. 1997;4(2):255–258. 4. Sagiv R, Sadan O, Boaz M, et al. A new approach to office hysteroscopy compared with traditional hysteroscopy. A randomized controlled trial. Am J Obstet Gynecol. 2006;108(2):387–392. 5.Bettocchi S, Ceci O, Nappi L, et al. Operative office hysteroscopy without anesthesia: analysis of 4,863 cases performed with mechanical instruments. J Am Assoc Gynecol Laparosc. 2004;11(1):59–61. 6. Chudnoff S, Einstein M, Levie M. Paracervical block efficacy in office hysteroscopic sterilization. A randomized controlled trial. Obstet Gynecol. 2010;115(1):26–34. 7. Garcia AL. Stop performing dilation and curettage for the evaluation of abnormal uterine bleeding. OBG Manag. 2013;25(6):44–48. 8. Keyhan S, Munro MG. Office diagnostic and operative hysteroscopy using local anesthesia only: an analysis of patient reported pain and other procedural outcomes. J Minim Invasive Gynecol. 2014;21(5):791–798. 9. Angioli R, de Cicco Nardone C, Plotti F, et al. Use of music to reduce anxiety during office hysteroscopy: prospective randomized trial. J Minim Invasive Gynecol. 2014;21(3):454–459. Office hysteroscopy offers many benefits and is becoming more acceptable among patients and gynecologists for both diagnostic and operative procedures (TABLE 1). Despite its clear advantages, however, many gynecologists remain hesitant to perform in-office procedures out of fear that the patient, who is generally awake, will experience significant discomfort. In 2004, Bettocchi and colleagues reported nearly 5,000 operative hysteroscopic procedures performed with this technique (the “no-touch” technique) in an outpatient setting, demonstrating very high patient tolerance and a low degree of procedural pain. More than 90% of patients experienced little to no pain, except for those undergoing ­polypectomy when the polyps were larger than the diameter of the cervical os, as well as those who had anatomic abnormalities, with moderate discomfort reported by 33.2% and 12.7% of these women, respectively.5 These few patients may have benefited from anesthetic intervention for the procedure. The success of diagnostic and operative hysteroscopic procedures with minimal and acceptable levels of patient discomfort in the office depends, therefore, on multiple factors. Procedural factors affecting the outcome of hysteroscopy include the size of the instrument used, the type and length of the procedure, the use of preprocedure anesthesia or analgesia, and a vaginoscopic approach. The skill of the surgeon also affects the hysteroscopic experience and outcome. In addition, patient variables such as menopausal status, anatomic distortion (eg, cervical stenosis), and anxiety may adversely affect the patient’s experience. In summary, it is possible for the gynecologist to appropriately accommodate any given patient and clinical scenario, keeping in mind that many patients will require a customized approach for ultimate success. In this article, I review 3 recent studies on office hysteroscopy, focusing on the reduction of procedural pain and anxiety. Because of the protective effect of a high degree of surgeon experience, it is important that we offer adequate education in hysteroscopy during residency and postgraduate courses. Keyhan S, Munro MG. Office diagnostic and operative hysteroscopy using local anesthesia only: an analysis of patient reported pain and other procedural outcomes. J Minim Invasive Gynecol. 2014;21(5):791–798. In a 2010 review of randomized controlled trials of the use of local anesthesia versus placebo during hysteroscopy, data from several studies indicated a significant decrease in procedural pain when local anesthesia was given, while other studies found no difference.2 Most of the studies in that review evaluated a single site of anesthesia placement and focused on diagnostic hysteroscopy. The findings of that review, as well as the differential innervation of the uterine cervix and fundus (FIGURE), prompted Keyhan and Munro to evaluate the efficacy of multimodal local anesthetic for office diagnostic and operative hysteroscopy without the use of any systemic agents except for preprocedural cyclooxygenase (COX) inhibitors (TABLE 2). Accordingly, they placed local anesthetic at multiple anatomic sites to alleviate patient pain and improve procedural success in a spectrum of office-based hysteroscopic procedures. Procedures generally were performed using a continuous-flow sheath with an outside diameter of 5.5 mm and a 5 French operative channel for placement of operative instruments such as scissors, graspers, and sterilization microinserts. Normal saline or sterile water was used as the uterine distention medium, with gravity inflow assisted by pressure cuff, when necessary. Occasionally, a sheath system with an outside diameter of 6.5 mm was used, or an outside diameter of 9 mm for resectoscopic procedures using a bipolar radiofrequency resectoscope. When needed, cervical dilation was performed to accommodate the specific instrument used.